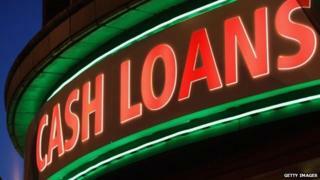 Borrowers are at risk of falling into the hands of illegal lenders because of "severe restrictions" on payday lending, a trade body has argued. Short-term lending has been cut by 68% in two years as regulators imposed price caps, the Consumer Finance Association (CFA) said. In a report to MPs, the trade body said that 80% of loan applications were rejected. Of these, 4% have borrowed from illegal lenders instead, the CFA claimed. "Our analysis of hundreds of thousands of loan applications proves that borrowers are being excluded from credit and concerns are growing for how they are filling the gap in their finances," said Russell Hamblin-Boone, chief executive of the Consumer Finance Association, which represents a string of lenders including The Money Shop and Payday Express. "It is time to draw a line under the attacks on short-term lenders, recognise the huge improvements in lending and accept that we have a highly-regulated, legitimate market to keep people out of the hands of unscrupulous, illegal lenders." Debt charities disagree with the CFA's view, arguing that the new regulations have reduced the likelihood of vulnerable borrowers being pulled into spiralling debt. Citizens Advice said it had seen a 53% drop in the number of payday loan problems it recorded in April to June compared with the same period a year earlier. "High-cost credit is not the answer to financial difficulties," said Gillian Guy, chief executive of Citizens Advice. "All too often payday lenders were lending to people to who could not afford to repay. The 53% decrease in payday loan issues reported to Citizens Advice shows the new regulations are having a positive effect for consumers." Peter Tutton, of StepChange debt charity, said: "Tighter regulation on payday has not made other kinds of debt worse. Firms have themselves acknowledged that the market needed to change." The Financial Conduct Authority (FCA) set a cap on the cost of payday loans of 0.8% of the amount borrowed per day, which came into force in January. In addition, there is a £15 cap on default charges. No borrower has to pay back more than twice the amount they initially borrowed, lenders can no longer roll over a loan more than twice, nor can they attempt to reclaim payment from a borrower's account more than twice. The CFA report suggests that, as result of the new regulations, the number of firms operating in the market has dropped from 240 in 2013 to about 30 to 40 offering a short-term loan within the price cap in 2015. It said supply was being "severely restricted" as lenders left the market or tightened their affordability checks. Only those with the best credit records were being granted loans. "The demand for short-term credit does not go away with a reduction in supply; consumers still require access to small sum short-term loans to manage their finances effectively," the report said. In a survey of people who applied for short-term credit, the CFA said that 26% of those who had loan applications rejected had failed to pay some form of bill or credit repayment. It said that people would be tempted by loan sharks, such as online, unlicensed money lenders.